The head of hedge fund manager Man Group Plc’s (EMG.L) China business has been taken into custody to help authorities in a probe into recent market volatility, Bloomberg reported on Monday, while separately a local financial reporter confessed on national TV to having spread false information that caused “panic and disorder”. 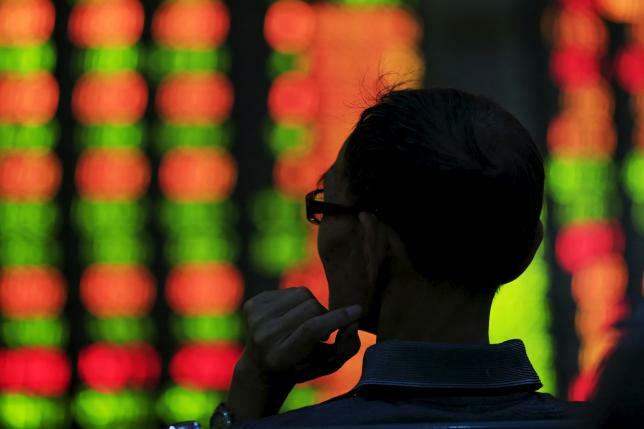 Both are likely to jangle nerves in the financial industry as regulators try to find out who they think was behind China’s wild stock market rollercoaster ride in the past three months. Authorities have been investigating possible market manipulation following wild swings in the stock markets, .CSI300 .SSEC which have plunged around 40 percent since mid-June on concerns of a slowing economy and a surprise devaluation of the yuan currency CNY=CFXS earlier this month. Officials are probing the financial industry amid allegations of malicious short-selling and other strategies seen as weakening confidence in the market. Bloomberg, citing a person familiar with the matter, said Li Yifei, Man Group’s China chairwoman, was assisting with police inquiries, noting this doesn’t mean she faces charges or has done anything wrong. Reuters could not independently confirm the report. Man Group spokeswoman Rosanna Konarzewski declined to comment on the matter, and China’s Ministry of Public Security could not immediately be reached for comment outside regular working hours. Li’s husband, Wang Chaoyong, told Reuters he had spoken to his wife on Sunday and Monday, and she had told him she was in “highly confidential” meetings. “She said she was in meetings and it’s inconvenient for me to contact her,” he said by phone, adding he did not know where the meetings were taking place. Separately, Chinese police are looking into the spreading of rumors about the stock market, as well as other issues such as the fatal explosions at a chemical storage facility in Tianjin. On Monday, Wang Xiaolu, a reporter for the Caijing business magazine, read a confession on national state television, saying he spread false information in his reporting of the stock market that had caused “panic and disorder”. “I shouldn’t have sought to make a big splash just for the sake of sensationalism,” he said. It was not possible to verify whether Wang made his confession freely or under any coercion. State news agency Xinhua said earlier that 197 people in total have been punished in the rumor campaign. The investigations are likely to unsettle China’s investment community, and the report of Li’s involvement could leave foreign investors particularly on edge. Li, a former MTV Networks executive, was appointed Country Chair, China in 2011, according to a page on Man Group’s website archived by Google on Aug. 6. The page is not currently accessible. Man Group says on its website it has $78.8 billion of assets under management. On July 29, I had a post titled “Do Not Fight against Rich and Powerful Government in Stock Market”, giving the advice that selling short against rich and powerful Chinese government’s efforts to stabilize the Chinese stock market is doomed to failure. I cited the incident of Hong Kong government defeating international speculators’ attack at Hong Kong stock market during the Asian financial crisis. Hong Kong government made huge profit from its intervention of the stock market. Now, the history is repeating. Speculators are attacking Chinese stock market against Chinese government’s efforts to stabilize the market. First, the Chinese government has the best sources of information about the market so that it knows what level to buy with certain profits. Second, it has much more the financial ammunition for the battle. Speculators have limited supply of shares for selling short as the number of shares in the market is limited. The government, however, has the power to forbid large shareholders’ sales of their shareholding; therefore, the speculators have limited ammunition. The government, on the other hand, has unlimited ammunition. First, it can increase money supply to such an extent as to enable it to buy the entire market. As a result, there will be no supply of shares for speculators to sell! Do not forget, Chinese currency is printed and issued by the Chinese government. Oversupply of Chinese currency will cause the exchange rate of the Chinese currency to fall, which is precisely what the Chinese government wants to support its economy and increase export. The Chinese government is killing two birds by one stone in doing so. True enough, the Chinese government reduced interest rate and relaxed reserve requirements yesterday to increase money supply. There will be more money and less shares to buy! Third, the government can change the rules while the speculators cannot. It can punish short sellers. Chinese law enables the government to imprison short selling speculators for the crime of disrupting the market. As for foreign investors, there are rules to restrict their sales of shares. China can tighten the rules while the speculators can do nothing but crying foul. The last but the most important: This is more a political than economic move aimed at winning popularity among the vast number of Chinese retail investors. It is what the Chinese government must do and must not fail! China’s central bank cut interest rates and relaxed reserve requirements for the second time in two months on Tuesday, cranking up support for a stuttering economy and a plunging stock market that has sent shockwaves around the globe. “This move makes sense from economics point of view. The real interest rates have stayed above double-digit for a few quarters, suggesting that the policy rates should be lowered aggressively. The market liquidity conditions have tightened significantly since the “one-off devaluation”, as PBoC bought CNY against USD to stabilize the exchange rate. In fact, we have seen that the agent banks stepped into the offshore market this afternoon to offer liquidity. “This is within our market expectations, the only small added is the interest rate cut, including the lower lending rate and deposit rate. The 50 basis point RRR cut is more important. This will inject 650 billion renminbi ($101.38 billion), a huge amount. This will ease hard landing concerns. “China’s decision to cut reserve requirements by 50 bp will be regarded by many investors as overdue, but nevertheless reassuring. It was the failure of the authorities to act over the weekend that seemed to spook markets yesterday as it strengthened the impression that Chinese policymakers were starting to rely more heavily on the exchange rate as a way of stimulating demand as opposed to taking additional domestic policy measures. “The PBOC is doing what it has to do, but it is very likely it is not enough so more will have to be done. The cut in the reserves rate (RRR), that was well expected, so no surprise at all and we have to remember that cutting RRR right now is not easing. It is just preventing a tightening. “Will it be enough? It’s difficult to say – it’s not a huge rate cut but it does show markets that they are willing to act in order to arrest any slowdowns. It has proved to markets that China is willing to act. Investors have been waiting for them to act and they have. “It might suggest there’s a change of tack now from directly trying to shore up the equity market to trying to limit downside risks facing the economy. “We’ve seen over the past couple of days that the so-called ‘national team’ hasn’t stepped in to stop the equity market from falling, so perhaps they have realized the futility of trying to prop up prices through direct purchases and it makes sense to concentrate on the macro repercussions. “I think the cut of RRR and interest rates is mainly aimed at supporting the stock market, as well as to ease capital outflows following yuan depreciation. It will offer a buffer to the tumbling stock market, but isn’t likely to have material support.